The 3T Forward Dumper is one of the most popular dumper models, and is ideal for towing equipment on difficult terrain. With a 4-wheel, reversing alarm, hydraulic tip as a standard feature, our 3T Forward Dumper is the most popular in its range. With a power steering to reduce operator fatigue, this dumper is perfect for picking up waste even in the most demanding of terrain. 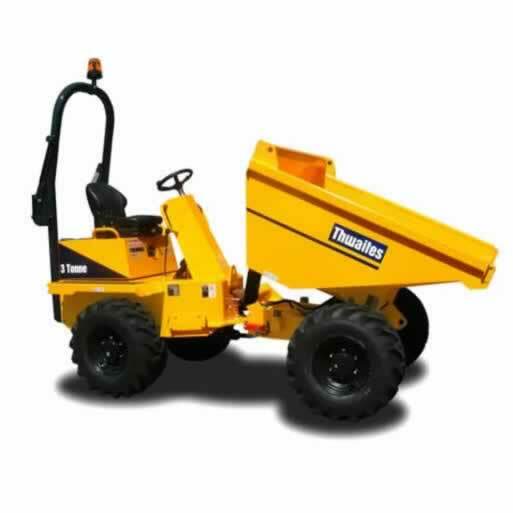 Boasting a diesel tank and a fuel capacity of up to 25 litres, this dumper does its job efficiently, and can carry a maximum load of 3000 kg. A true mid-range dumper, offering versatility and high performance. Alongside the several configuration options, here at PAL Hire, we can ensure that you get the exact machine for your intended use. With front options as well as the choice of either four-wheel-drive hydro-static transmission or manual, these dumpers are built to withstand even the toughest conditions. Add in the comfort, ease of use, safety and stability, this dumper can maximise the productivity on any job. Exceptionally rugged and durable, built to withstand anything the rental market can throw its way. State-of-the-art manufacturing processes such as robot machining. High tolerances and accurate location of your 3T dumpers pins and bushes with precision machining techniques. starting performance down to -15°C. Heavy duty damage-resistant articulated chassis and skips. Maximum strength and reliability on even the toughest of work sites. Thick steel side walls and heavy duty steel front and base plates. Fitted hinged roll over protection structure for operator protection in the event of a machine overturn. Always ensure you wear the correct PPE required by the task. All equipment is serviced regularly and our local engineer will contact you to arrange on site servicing or maintenance in accordance with our scheduled maintenance programme.